In 12-inch nonstick skillet, heat oil over medium heat. Add chicken nuggets; cook 4 to 5 minutes, stirring and turning occasionally, until thoroughly heated. Remove chicken from skillet; place on plate and cover to keep warm. Wipe skillet clean with paper towel. In skillet, mix sauce chips, vegetables and pineapple from meal starter. Cover; cook over medium heat 5 minutes, stirring occasionally. Crumble ramen noodles. Stir noodles, contents of seasoning packet from soup mix and water into vegetable mixture. Cover; cook 4 to 5 minutes, stirring occasionally and separating noodles, until vegetables and noodles are tender. 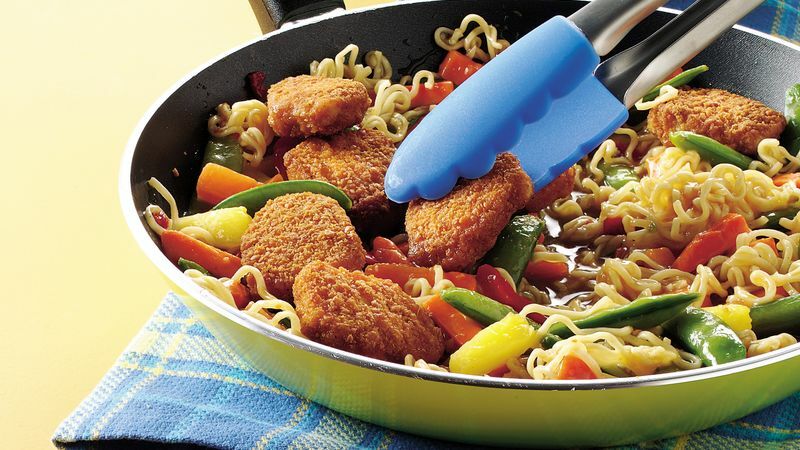 Serve topped with chicken nuggets. At the grocery store you will find pkg sizes for chicken nuggets that range from 11 to 16 ounces. Any size can be used for this recipe.